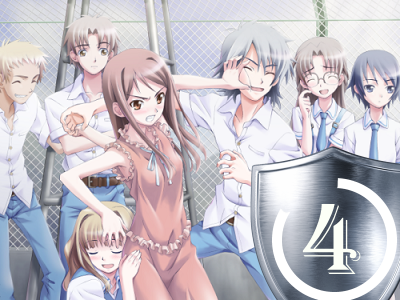 The defining work of the highly esteemed ‘literary’ visual novel writer Tanaka Romeo (田中ロミオ), Cross Channel is an odd hybrid of slice of life school drama and existential horror thriller. The seemingly peaceful school life full of slapstick humor instantly turns morbid when you suddenly realize this school is actually a caring center for mentally deranged individuals and the world is not really working the way it should (or at least that’s how it looks to YOU). There is an odd thrill at watching light-hearted comedy and pondering if you should take it at face value or as a delusion of a mentally deranged protagonist, an unreliable narrator who is trying to sugarcoat an otherwise really terrifying story about psychological abnormalities, torture, and even murder. Unfortunately, while the morbid atmosphere, the lingering mysteries, and the thought-provoking narrative are all certainly a treat, Cross Channel is also hampered down by pacing issues, overabundant humor that sometimes falls flat and a cast that is very hard to make an emotional connection with. It might be a personal thing, but I just couldn’t force myself to care about any of the characters save for the protagonist in this vn, not because I hated them or something, but because they were just kinda boring to me. The serious scenes toward the end have their own share of problems as well. Sometimes their presentation can become so cryptic one can easily lose the track of the whole story pretty fast; a shame given the depth of their psychological implications and philosophical ideas. While I don’t usually mind intellectually challenging material, I got the impression that Cross Channel is either trying to be deliberately obtuse or that Romeo simply has trouble expressing his ideas in an understandable way. Either way, Cross Channel is a thought-provoking treat and while it, in my opinion, has many issues, it still should be experienced at least once by everyone. It’s definitely what you’d call a ‘literary’ work of visual novels.